I’ve heard it said that the success of the creation of the United States was due in part to the American society being founded on a frontier. Of course the Native Americans were already in North America when the “white man” showed up, but the land was sufficiently “up for grabs” for some element of force and technology to overtake “we were here first.” How that unfolded is unfortunate, but I believe generally moot. The overarching nature of North America was a place without property rights or government. This frontier paved the way for the establishment of a new form of government, a Constitution, and the United States. Today, what is left unclaimed? Where are the frontiers? How can we experiment with new forms of government if we have no more frontiers left? I think Patri Friedman has enumerated this problem: lack of competition due to both a lack of options (frontiers) and high transaction costs to changing governments means society stagnates within archaic, increasingly bloated and controlling bureaucracies. We need a lot more frontiers if we want to see alternatives to the status quo. However, all the land save the uninhabitable Antarctica has been claimed, so where can we find any frontier, much less the needed abundance to really see a plethora of options take form? And of the options available, which are actually likely to take form? After all, putting “practicality aside” is easier said than done. Revolting against current regimes can create a frontier of sorts, but if history is any guide (a poor guide), post-revolution governments (again U.S. being excepted for various reasons) don’t tend to be much better than the one’s they replace. Out with the old boss in with the new boss. To some extent, the New Hampshire Free State Project is taking this approach. I wish those liberty-minded folk the best of luck. Another solution to the shortage of frontier is to go to the oceans. The oceans make up a huge amount of “unclaimed” frontier. Sure, they are water and not land — slight problem. But there is an ounce of historical precedent to support new sovereign nations at sea: see Sealand. 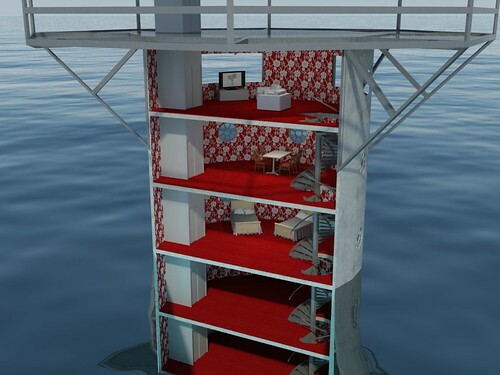 This solution to the frontier-problem is what the Seasteading Institute is pursuing. I’m lending my support to TSI however I can, and I wish Patri the best. Assuming mankind doesn’t blow itself up and we eventually learn to cheaply blaze a trail through the universe, space truly will be the “final frontier” (Save transdimensional pioneering). There are untold millions of planets out there that are just waiting for bungalows and Wal-Marts. Human existence in space could look something like Firefly or perhaps a new frontier is made from the Moon a la Robert Heinlein. Homesteading space just presents a few teeny logistical hurdles. What about the Internet? Even having advanced radically over the past two decades or so the Internet is still very much a wild west. Could the Internet be the frontier we have available right now to secure increased human freedom? The logistical problems are fairly obvious, of course. The internet is virtual and as much as our lives become digitized, we still have to eat and live in real space. However, the government can’t tax what it doesn’t know you have. Encryption creates frontier by obscuring information from the taxman. Further, there’s a natural progression that increases the likelihood we move more of our lives beyond the purveyance of Big Brother: as governments make our existence in real space more onerous, there will be ever-increasing incentives to take life to cyberspace, encrypt it, and thereby restore freedom. For practicality purposes, this may be the best option we have for at least increasing our freedom in the near term. To some extent, it is already happening (i.e. see The Pirate Bay’s fight against the RIAA and MPAA). The frontier problem is real, but human ingenuity is vast. Are there other frontiers out there worth pursuing? Freedom where art thou?